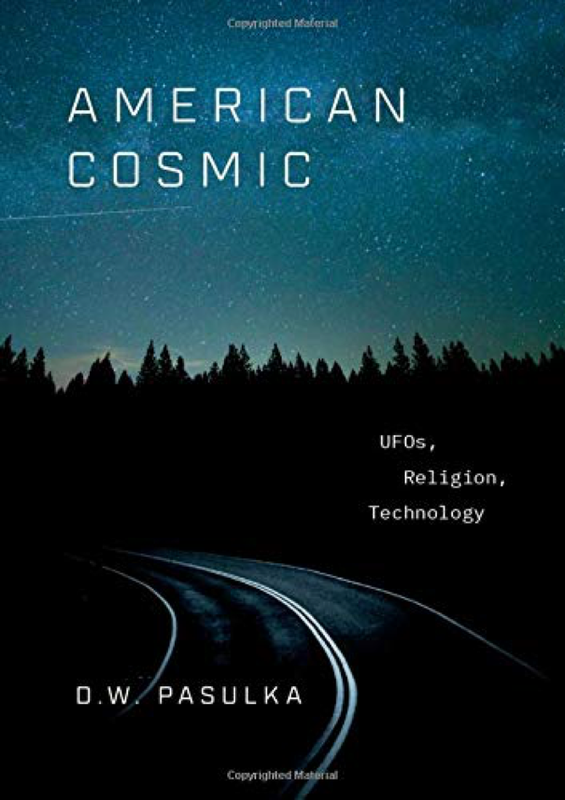 Hermetic Library Fellow T Polyphilus reviews American Cosmic: UFOs, Religions, Technology by Diana Walsh Pasulka. The book American Cosmic was six years in the making by an established scholar of religion and issued by Oxford University Press. Nevertheless, it is very accessible and addressed to a general audience. It has a significant measure of “reflexivity,” often exhibited in stretches of first-person narrative. Author Diana Pasulka references as sympathetic colleagues Jeffrey Kripal and Tanya Lurhmann, both researchers I’ve met and whose work I’ve found valuable. Within the relevant field of UFO studies, Pasulka boasts herself a “fan” and co-worker of Jacques Vallee, making special reference to his book The Invisible College. Paulka says at the outset that the investigations she undertook to research this book resulted in multiple forms of “epistemological shock” for her. Not only was she brought to confront the currency of ufological beliefs among members of the economic and intellectual elite in the US, but she also realized the extent of the willful falsehoods and disinformation presented in various media and social milieus. Early on, she addresses the manner in which the research regimes of academic transparency and trade/military secrecy create unbridgeable chasms in communication. Although she demonstrates it in the course of the book, she doesn’t explicitly call out the extent to which this tension can come to lodge itself within the experience of an individual, and I think this dynamic, as much as the “embarrassment” often remarked by Paluska, helps to account for the anxiety and social opacity of those she calls “experiencers” (i.e. contactees and witnesses) and “meta-experiencers” (a.k.a. “scientist-believers”). The extreme case of this latter category Paluska calls “Invisibles.” These are successful scientists who avoid any public profile for their work, rejecting visibility in any media including the “social” media of the Internet. Two of these Invisibles figure as sources and collaborators in the book, where she has given them cover names: “Tyler D.” (“the first rule of Fight Club is …”) and “James” (“Master of the Multiverse”). Although she is scrupulous about their anonymity in the book, some of the incidents related there imply that their identities might be deduced by some of her fellow academics. The book repeatedly though briefly references the modern philosophical tradition. Pasulka’s readings of Heidegger and Baudrillard, while certainly relevant to the subject at hand, tend to simplify the positions expressed by those writers in ways that gave me pause. On the other hand, her engagement with Nietzsche is one which I can both respect and sympathize with. I think Pasulka amply demonstrates the usefulness of religion as a paradigm for viewing the social effects of UFO phenomena and ideas. Not only does she (following Vallee and Kripal) highlight the elements of the miraculous, but she discusses the ways in which non-empirical concepts become experientially actual. She does not compare the passion of UFO researchers to religious fanaticism, but rather to religious vocation. The book makes passing reference to parapsychological idioms and theories, but does not resort to them as part of its method. There is also very little reference to esoteric religion or occultism, although those familiar with that field will have little difficulty seeing the considerable areas of overlap with the business of this study.